The Acctivate Product Import allows you to import new products but also update existing products. If you find a need to change a few Product ID’s in Acctivate then you can use this import feature to do that for you. You will use the regular Products import type listed under Inventory on the Import Data window. The only required fields for this type of import are going to be the Existing Product ID (listed in the import mapping as Product ID) and the New Product ID for each product you want to update. On the Options tab, you can select to ‘Discard data if matching record is not found in database’ to ensure that you are not going to try to create a new product with the import. At the same time, you can also add any other fields you would like to update on the import. 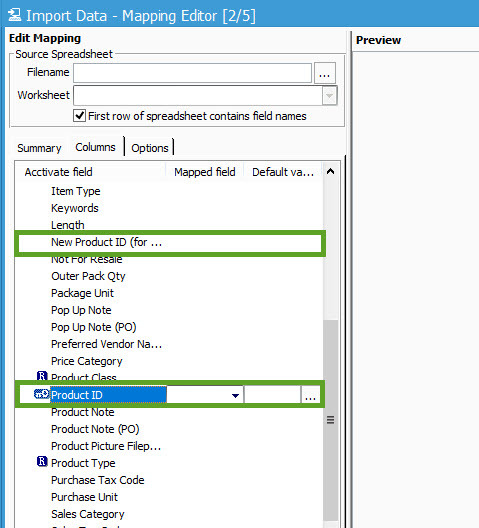 See the Product Import article for a full list of fields.